MoonMarble.com - Fritz Lauenstein - "Orange Cane Marble"
Art Glass → Contemporary Handmade Marbles → Fritz Lauenstein - "Orange Cane Marble"
This is a handmade marble by Fritz Lauenstein. 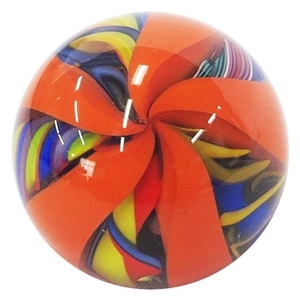 It has alternating canes of opaque orange and multi color twisting latticino canes going from the top pole to the bottom pole all around the marble. Marble measures 1 5/8" in diameter. Signed and dated.